NASA's Cassini spacecraft has captured a gorgeous backlit image of Saturn and its rings, providing a holiday treat for scientists and the public alike. Cassini took the photo — actually a mosaic of 60 images — on Oct. 17, while looking back toward the sun from a spot within Saturn's shadow. Such a view can reveal details about the planet's atmosphere and rings that aren't otherwise visible, researchers said. The image also highlights the beauty of the ringed planet, which everyone can appreciate. 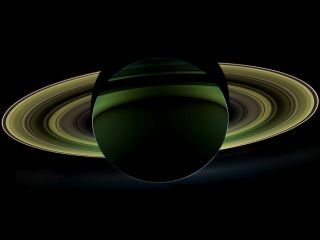 "This glorious image is our special gift to you, the people of the world, in this holiday season that brings the year 2012 to a close," Cassini imaging team lead Carolyn Porco, of the Space Science Institute in Boulder, Colo., said in a statement. "I fervently hope it serves as a reminder that we humans, though troubled and warlike, are also the dreamers, thinkers, and explorers inhabiting one achingly beautiful planet, yearning for the sublime, and capable of the magnificent," she added. Two of Saturn's many moons are visible in the newly released photo as tiny white dots below and to the left of the planet's rings. Geyser-spewing Enceladus, which likely harbors an ocean of liquid water beneath its icy shell, is closer to the rings; Tethys sits farther below and to the left. The 60 images composing the new mosaic were taken in violet, visible and near infrared wavelengths, researchers said. The overall image was processed in false color. The $3.2 billion Cassini mission is a collaboration involving NASA, the European Space Agency and the Italian Space Agency. Cassini launched in 1997, arrived at Saturn in 2004 and delivered the Huygens lander to the surface of Saturn's huge moon Titan in January 2005. Cassini should continue studying Saturn and its moons for years to come; its mission has been extended though at least 2017.